There was an unhappy return to the New Windmill for Liam Daly, Stefan Moore and Tony Breeden as Leamington grinded out a victory which lifted them clear of the Conference North’s bottom three. Moore cut a pretty forlorn figure on his return to the New Windmill, superbly marshalled by Delroy Gordon and Jamie Tank, but Daly and Breeden were more central to the proceedings. Breeden produced a string of saves, including two superb point-blank efforts to deny Danny Newton in the second period, while Daly, who took the captain’s armband for the visitors, was a commanding figure at the back. However, it was the one occason that he went missing that was to prove crucial, with Brakes taking advantage of his ambling back from a Solihull corner to score the winner in the 87th minute. With Owen Story having also worn the gold and black and another former Brake on the Solihull bench in the shape of Jay Denny, there were several sub-plots to a game which took on added importance for the hosts who had dropped into the relegation zone on the back of a poor display at Edgeley Park. A biting wind which blew straight across the pitch made life difficult for both sides in the early stages. A neat piece of skill from Jordan Goddard almost unlocked the Solihull Moors defence in the 11th minute but Nathan Hicks’ ball to Danny Newton was slightly behind the striker and the opportunity was lost. Tank was in the right place to block a Omar Bogle shot and Reece Fleet sent an effort wide from a corner just short of the half-hour mark, but goalmouth action remained at a premium. Story unleashed a fierce shot which was always rising and Newton went into the referee’s notebook after needlessly kicking the ball away following an offside ruling. Hicks had two shots in quick succession, one straight at Breeden and the other dragged narrowly past the post before Goddard almost broke the deadlock after being released in the box by Lee Moore. However, instead of shooting across goal, the midfielder went for the near post and Breeden got the faintest of touches to divert it for a corner. After a cagey opening 45 minutes, there was much more space to be had in a second half which kicked off five minutes early due to concerns about the lighting; more than half of the floodlights having failed to come on. Newton nipped in to get on the end of Hicks’ pull-back from the byeline, but Breeden reacted superbly to tip his first effort on to the crossbar from point-blank range, recovering well to block his fiercely struck follow-up. At the other end, Ryan Beswick flashed a shot across goal, with Bogle inches from adding a decisive touch. Hicks failed to get decent purchase on a shot from the angle and Breeden saved with his feet after Lee Chilton had been fed by a great inside ball from Newton. Stephan Morley flashed a shot well over and was then presented with a shooting chance on the edge of the box after Daly was adjudged to have conceded a free-kick. However, Daly atoned for his error by blocking Morley’s dead-ball attempt. Beswick looked to have opened the scoring from a left-wing corner, but the referee quickly dampened the Solihull celebrations after spotting the striker had put the ball in with his arm. Newton got the better of Daly after latching on to a through ball, but lifted his shot over the bar and play quickly switched to the other end where Atkins was called on to make his first meaningful save, diverting Bogle’s shot for a corner. Michael Nottingham headed over from a Moors corner and it was from another corner for the visitors that Leamington made the all-important breakthrough. Brakes’ initial threat looked to have petered out, but the ball was returned to Chilton, who worked it wide to Morley and the left-back’s cross was headed home by Newton from eight yards. As the Brakes bench raced on to the pitch to celebrate, Daly was still ambling back over the half-way line after Moors’ original setpiece. The former Brakes defender was pushed up front as Solihull went in search of an equaliser, aided by a rather generous four minutes of injury time from referee Rob Massey-Ellis. There was an anxious moment when Moors substitute Darryl Knights let fly from just outside the box, but his effort was just off target and it was Brakes who came closest to adding to their tally. Moore’s ball over the top released Chilton, but despite his lofted effort beating Breeden, it landed on the roof of the net. 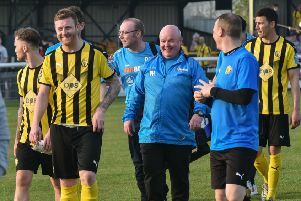 It was not to matter, however, as Brakes saw out the additional minutes to claim a much-needed three points as well as bragging rights over their former team-mates. brakes: Ross Atkins, James Mace, Stephan Morley, James Fry, Delroy Gordon, Jamie Tank, Lee Moore, Jordan Goddard, Lee Chilton, Nathan Hicks, Danny Newton. Subs not used: Matt Dodd, Aron Wint, Lewis Fenney. Solihull Moors: Tony Breeden, Michael Nottingham, Jordan Gough, Reece Fleet, Liam Daly, Richard Taundry, Stefan Moore, Junior English (Darryl Knights, 84), Omar Bogle, Ryan Beswick, Owen Story (Rob Elvins, 80). Subs not used: Jay Denny, Aitor Espejo, Darren Acton.